I know it has been a long time but I’ve been meaning to email you for a while! Bayou is doing fantastically! I now work in an office at a design firm and she comes in with me all the time and absolutely loves it (and so does everyone else). She loves doing just about anything as long as she is around her people. When she has to be alone, spends her days napping and sunbathing. She’s honestly the best and I can’t imagine my life without her. Thanks so much for making it possible to have this wonderful dog in my life. What fun to hear from you! We are delighted to see and hear the news that Bayou is well-socialized and a fantastic family member. Of course, this is exactly what everyone dreams will happen. 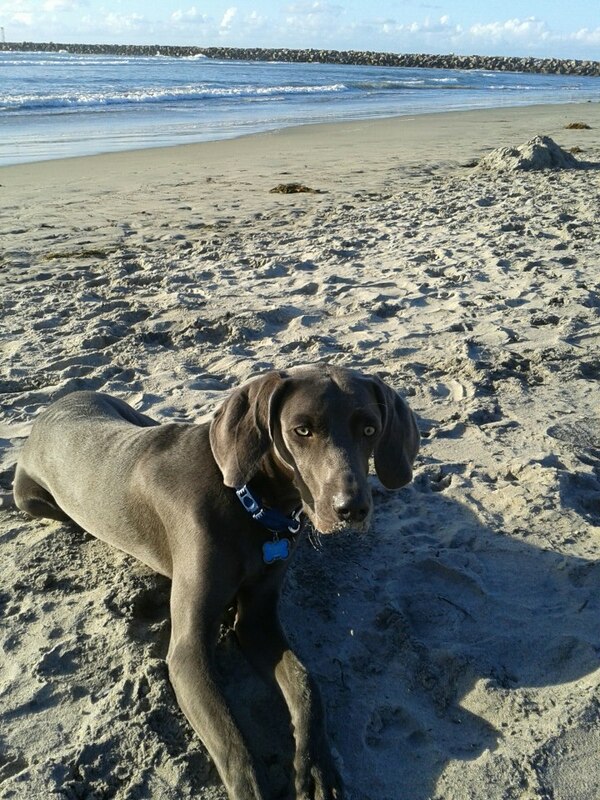 The Weimaraner can be challenging–isn’t it worth it?!? Thank you, for thinking of us as well as being a great Weim-loving family. Sunny is amazing. For some people their weimaraner is “part” of the family, and for others like me, their weimaraner “is” their only family. Sunny did alot of “affectionate” nipping, and I donated my fair share of blood, but slowly but surely it got better. Now at a year old, this issue has passed completely, and he’s very gentle with his mouth. Now still working on calm greetings, and not jumping up when over excited…… It’s been very fun. One more comment on the puppy nipping. I have learned that it is very important to control the interactions that my dog has with people we meet along our travels together. People often wanted to play rough with Sunny with their hands, and then he got out of control, and started nipping. Then, I don’t think it’s fair to the dog to correct him for nipping after he got too wound up. These weim puppies just can’t control themselves when they get too excited at a young age. So I used to always carry a booda bone or toy to substitute when playing. Biting the toy…..good dog…… ! If someone I meet won’t play with my dog in an acceptable way, I take Sunny away from the situation immediately. Breeder’s Note: Rod raised Sunny in the middle of his life, and since he takes him to work every day (click here to read more) it was important to get results very quickly. We often say it takes a knack to raise this breed, and that is probably a good way to explain things. 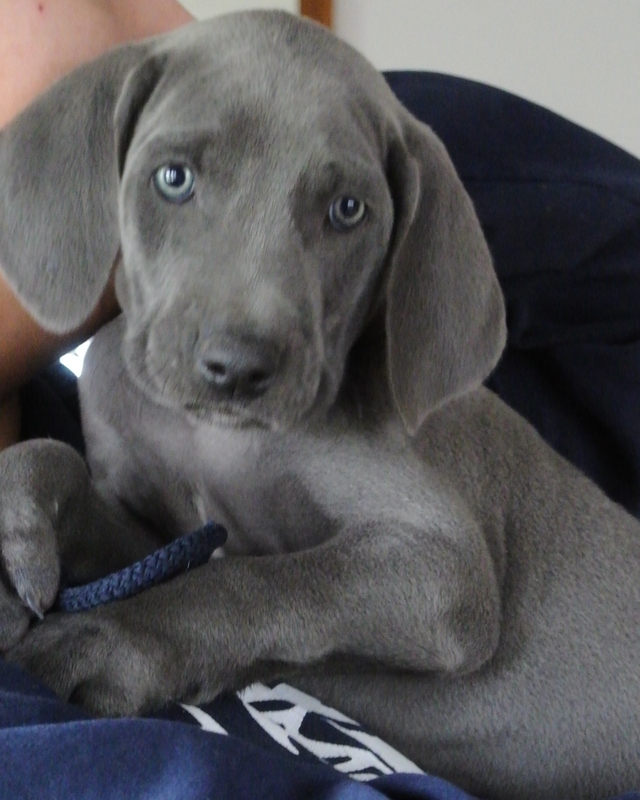 There is not a one size fits any situation and approach to raising the Weimaraner. This is what gets some seasoned Weimaraner owners into trouble with their next Weim. They come to the new relationship with a lot of preconceived ideas, rather than looking at this as a fresh opportunity. Either they are thinking they are endowed with dog-savvy and experience, so they know best, or they are over compensating for mistakes made the time before. Neither is a good approach to a new situation. Rod’s comments (posted in this blog) were in response to yesterday’s blog. We thought they might prove helpful to those of you struggling with puppy biting. It can grow old, and you can become weary of having to deal with it. In time, it will pass if you don’t over react. Freddy reports Tauntaun goes to work (Oct 26, 2012 ): He is having a blast at my branch. Clients and employees alike just love him. The branch wants to adopt him as our mascot. Wonder how they will feel in about 7 – 12 months after he has grown a lot. I can not express to you how wonderful it feels to have a dog again. He will be loved and bring much joy to us as we to him. Thanks again for such wonderful dogs that you and Cliff (at OwyheeStar) work so hard with to bring joy and happiness to so many families….. Especially ours.